Have you ever had one of those days where you just know it was going to be good day? Maybe you hear a string of your favorite songs on the radio. Or maybe you get a fantastic parking space at a busy mall. Or discovering a $20 bill in the pocket of a forgotten coat. You know what I'm talking about. Some days are just good out of the gate. I experienced a day just like that recently, let me tell you about it. It was a bright, sunny Saturday morning, and I had another great Aperture Academy Workshop on the schedule. Today, it was at the gorgeous UC Santa Cruz Arboretum, in Santa Cruz, Ca. As I was heading out, I was greeted by a hummingbird zooming around my front yard. Hummingbirds always make me smile, and I took this as a sign it was going to be a good outing. 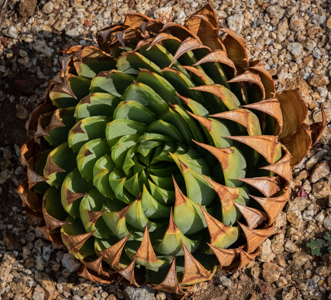 The Arboretum is a 135 acre research and teaching facility maintaining over 300 plant families, some of which are rare and threatened, from Australia, New Zealand, South Africa, and California. 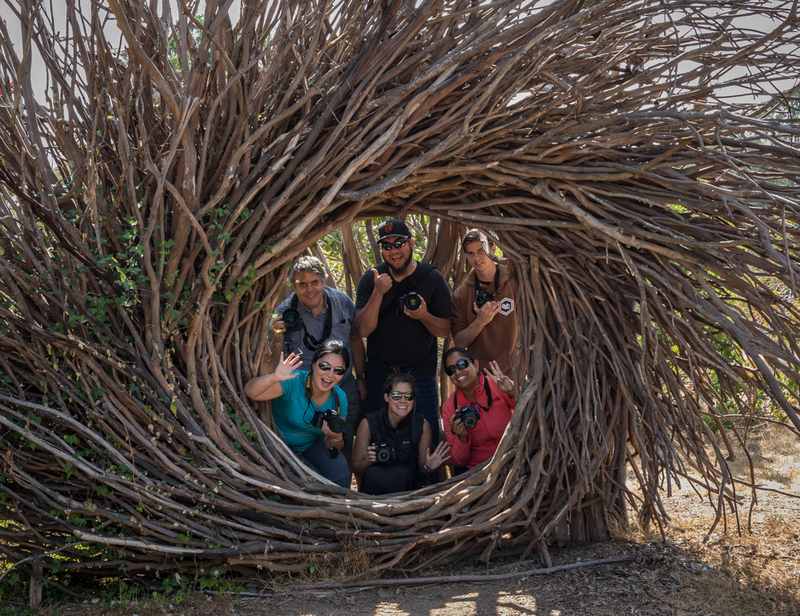 There is also plenty of wildlife in the form of zooming hummingbirds, beautiful butterflies, fluffy rabbits, darting lizards, even the occasional deer or two! 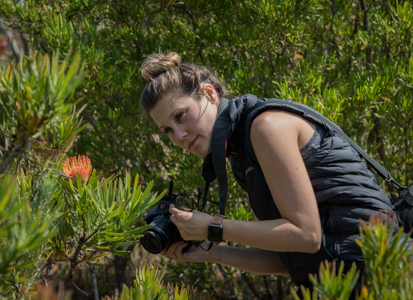 This rich diversity offers a unique opportunity for study, research, and of course, photography. The gardens change dramatically with the seasons and it is always fun to discover what awaits. I met with 6 excited photographers with whom I was excited to share my great day. We started with brief introductions to get better acquainted. 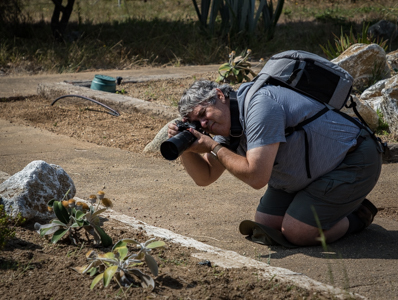 Then I covered a few of the basic principles of photography that we would be practicing during our workshop. I reviewed the technical aspects of the Exposure Triangle and how Aperture (Depth of Field), Shutter Speed (Motion Blur), and ISO (Noise) work together to create images. We talked about some of the environmental challenges we might have to work with, such as wind, bright sun, and dark shadows, and how we might overcome those. Then it was time to get started taking pictures! The day was starting to warm up quickly, so we got moving to take advantage of the cool temperatures for as long as we could. 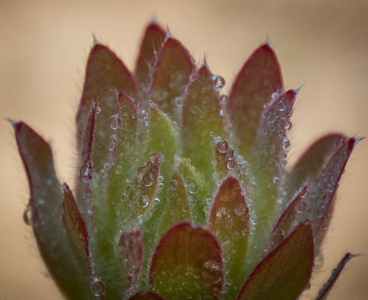 We started with the fragrant plants in the Aroma garden, then moved to the varied cacti in the Succulent garden. 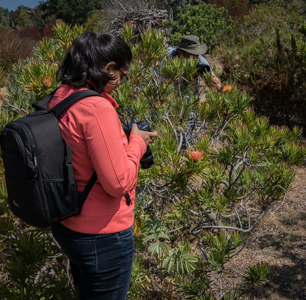 My students spread out through the area in search of the perfect subjects. 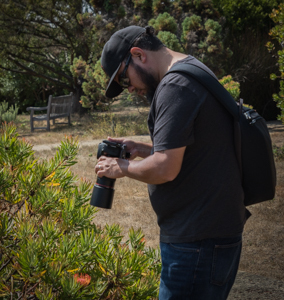 I made my way around to everyone answering questions, reviewing images, and helping people get comfortable with their cameras. We kept moving through the gardens, stopping whenever we saw something interesting. I discussed how the conditions changes when we go from the bright sun to the shadow of the trees and how to make adjustments. We talked about how to be aware of backgrounds to eliminate distractions in our images. 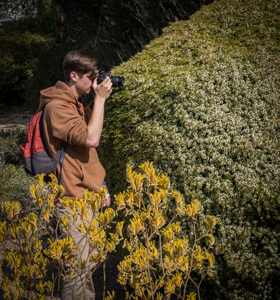 Each area of the arboretum offered opportunities for creative subjects. Some were the colorful flowers, some were the repetitive patterns in the shrubbery, but everyone was able to find something interesting to work with. I worked with each student, answering more questions, providing feedback, making suggestions on composition and settings. Remember how I said I knew it was going to be a good day? 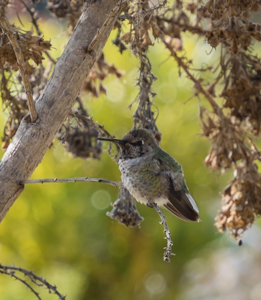 On a normal day in the Arboretum, hummingbirds are very prominent and you can always hear them zooming around high above your head. But today was different. Today the hummingbirds zoomed around our heads, and some of them actually landed in branches and let us get a few pictures! It was pretty special and a real treat for me and my students. The Arboretum also hosts a few permanent art installations and statues. We stopped at one that looked like a giant camera lens for our group photo. Everyone crowded in and looked out the "lens" with big smiles! We continued on our walk through the gardens to see what else we could find. Throughout the morning, I checked with each of my students to help them fine-tune compositions, explore different camera settings, reinforce some of the concepts we were learning about, and most importantly, make sure everyone was having fun! I challenged everyone to really look at the subject matter, try to see the different angles, move positions to create more interesting compositions, and appreciate the colors, textures, and the setting as a whole. It was awesome to see everyone getting up close and personal with the plants they saw. No one was afraid of getting a little dirty! Time really does fly when you're having fun. It was fast approaching the end of the workshop, and we stopped near Norrie's Gift shop to sit for just a bit while I answered a few final questions, gave a few more bits of information and encouraged everyone to continue practicing what they had learned today. Then I said my final farewells, and closed the book on another very successful Aperture Academy Workshop!